This is a really interesting film as it tells you a lot about the times, the man and the life of Paul Raymond and it's not all about the decadence of his clubs or the magazines he published, but it's also about his family, a man's capacity to be a good father and a bad father, and to love and be neglectful all at once. 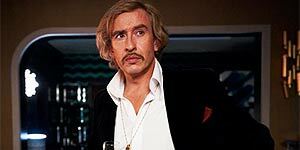 Coogan is really good and it's a great watch for anyone who loves London too. Winterbottom's direction is very simple but effective, almost like a documentary in places but also very gentle.